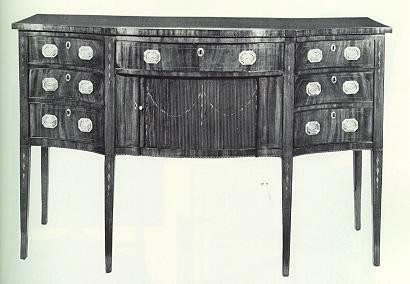 13 Fine Hepplewhite inlaid mahogany serpentine front sideboard, the recessed bow front tambour compartment inlaid with a drapery bellflower garland in the manner of John Seymour; the tapered legs and stiles also inlaid with bellflowers of graduating size, the center compartment flanked by a row of drawers at each side retaining the original octagonal chased brass handles; fine, mellow brown patina. School of John Seymour, Boston, Massachusetts, circa 1790-1800. 67 1/2" long, 43 1/2" high, 25 3/4" deep. Photo Credit: American Antiques from Israel Sack Collection - Highland House Publishers Inc., Volume __ , Plate 4647.